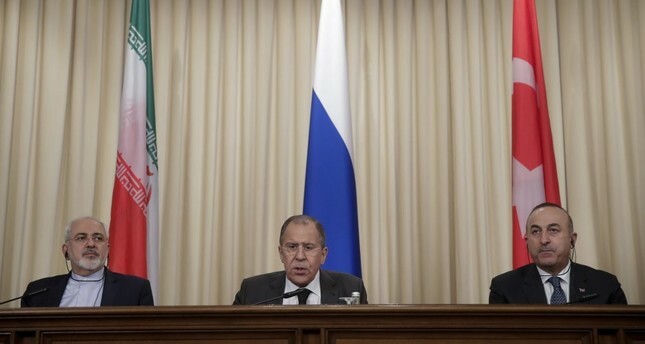 Iranian Foreign Minister Mohammed Javad Zarif (L), Russian Foreign Minister Sergey Lavrov (C) and Turkey's Foreign Minister Mevlüt Çavuşoğlu at a joint news conference after their talks of in Moscow. Iranian Chief of Staff Gen. Mohammad Hossein Bagheri's meetings with Chief of General Staff Gen. Hulusi Akar and President Recep Tayyip Erdoğan during his three-day visit to Ankara are expected to bear concrete results in Idlib, Syria as the ball is now in the court of experts from the respective countries to discuss minor details, senior diplomatic sources in Ankara told Daily Sabah. The Turkish and Iranian military chiefs in their meeting in Ankara earlier this week shook hands on a joint de-escalation zone mechanism in Idlib, which would also include the Russian military, high level sources said. The generals came to a mutual understanding for the controversial Syrian town to "easily sort out the issue." Ankara, Tehran and the Kremlin have recently ramped up joint efforts to find a way out in Idlib after the United States signaled an offensive on the town on the grounds that it has become home to al-Qaida-affiliated groups. Following the unprecedented visit by the Iranian chief of staff, the Russian chief of staff will now pay a visit to Turkey in the near future, Foreign Minister Mevlüt Çavuşoğlu said on Wednesday.The sources stressed that even though Ankara and Tehran are on the same page regarding Idlib, experts from all three countries will work on the details of the three-way mechanism. "What mattered in the meetings was that there is a will from all three sides to take action," one said. The tensions concerning Idlib quickly escalated after the U.S. special envoy for global coalition to counter Daesh, Brett McGurk, contended that the town has become a hotbed for al-Qaida terrorists. Speaking at a panel on U.S. President Donald Trump's fight against terrorism in the Middle East Institute in Washington on July 30, McGurk said: "Idlib has turned into a safe zone for al-Qaida terrorists on the Turkish border." "A three-sided mechanism in Idlib would work out well because both Iran and Russia are against the PKK-affiliated PYD's [Democratic Union Party] cantons just like Turkey, and these three countries' cooperation to a great extent in trying to establish de-escalation zones," Ahmet Uysal, the head of the Ankara-based Center for Iranian Studies (IRAM) think tank, said. Amid the optimistic atmosphere in Turkish media, Bagheri has seemed satisfied with his tvisit as he told the Iranian media that "it was a necessary visit for better consultation and collaboration on various regional and military issues." The senior sources asserted that the way Bagheri was welcomed and treated in Ankara was appreciated and the visit pleased Tehran. As for Ankara, Prime Minister Binali Yıldırım said on Friday that the ultimate target is to stop the civil war in the Idlib region and southern parts of Syria. "Turkey, Russia and Iran started the Astana process in order to provide permanent peace in Syria. A permanent solution is expected to be achieved. Senior officials have come together to assess the situation from time to time. The aim here is to stop the civil war in the Idlib region and the southern regions," the prime minister said. Refusing to rule out a joint ground offensive by Turkey, Russia and Iran in Idlib, Yıldırım said: "An operation against terrorist organizations is always on the agenda." Hakkı Uygur, an expert on Iran and the author of "Iran and Regional Geopolitics" and "Iran: Building of National Identity," said in an article on Aug. 16 that the two countries have their own reasons to enhance security and military cooperation. Stressing that Ankara-led initiatives to sort out the crisis in Idlib will rule out the regime change in Syria, Uygur said: "Turkey will be more easily able to increase its cooperation with powers that prioritize Syria's territorial integrity." The restlessness in Idlib, Syria, and People's Protection Units-held (YPG) Afrin has recently forced Turkey and Iran to communicate and collaborate more than ever. Also, the common opposition to the Iraqi Kurdistan independence referendum brought the two countries closer. Furthermore, Daily Sabah learned last month that a Turkish delegation of representatives from the National Intelligence Organization (MİT), the Turkish Armed Forces (TSK) and the Foreign Ministry held talks in Tehran in mid-July with Iranian and Russian authorities regarding Idlib and Afrin. Apart from the joint mechanism in Idlib, Ankara and Tehran see eye to eye on the Kurdistan Regional Government's (KRG) independence referendum on Sept. 25. Bagheri said after meeting with Erdoğan and Akar that the independence referendum would trigger conflict and negative consequences for the entire region. "Both sides stressed that if the referendum is held, it will be the basis for the start of a series of tensions and conflicts inside Iraq, the consequences of which will affect neighboring countries," Bagheri said. Ankara retains its staunch stance on the issue. Presidential spokesman İbrahim Kalın on Thursday criticized Irbil's plans to hold the referendum without reaching a consensus with Baghdad, asserting it will put them in a difficult situation. "First of all, this referendum will not be held in a manner that will cover the whole of Iraq's people, it will be done in a region only," Kalın said.